Please welcome Jennifer Ponce to the blog ahead of her new release The Bazzar coming out one week from today! Check back on the blog for more details! Even though I wrote throughout high school and college, I wasn’t really writing. I was playing and it was fun. It wasn’t until I read Stephen King’s On Writing that I started writing with an eye for publication. Current authors who inspire me are Lilith Saintcrow, Kim Harrison, Faith Hunter, and Jennifer Estep. I’m also inspired every day by all the amazing, talented, and friendly indie authors I’ve become friends with through a fantasy writer’s group on Facebook. I’m proud to have such great writers to talk with and learn from. 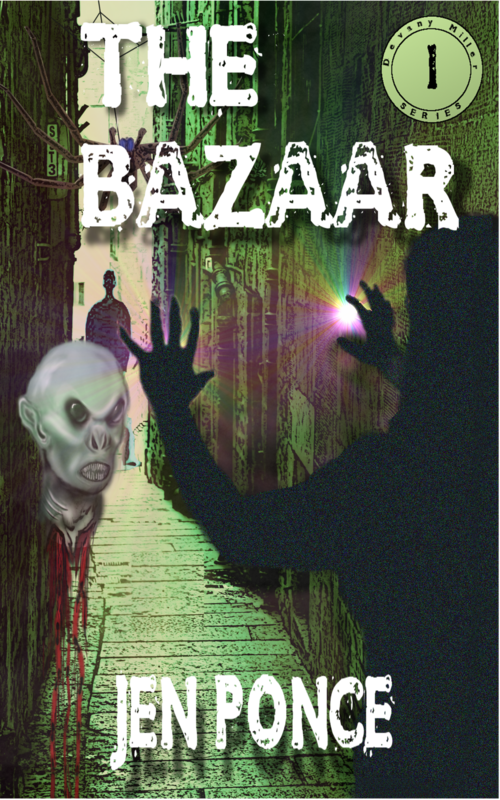 My first published book is The Bazaar and it’s available exclusively on Amazon in both paperback and ebook form. I’ve been posting short stories on my blog that are free for anyone to read. Give us an insight into your main character. What does she do that’s so special? The idea for The Bazaar started as a dream. It was full of action, an imperiled witch, an assassin spider, and another world accessible from our own through places called Hooks. Unfortunately I didn’t have any anchor for the story, no compelling character who would experience these things. I knew I wanted a character that was firmly grounded in our reality, who had her own mundane troubles to deal with. I liked the idea of having a character who had kids be a main character as well because most of the kickass characters in the books I’ve read are single women. My main character, Devany Miller, is a wife and a mother. She has a job and all the stress that goes along with that. She’s special because she does the right thing even when it’s the hard thing. I put her into a lot of scary and dangerous situations that don’t always work out to her favor, but she keeps fighting. What are you working on at the minute? What’s it about? I’m working on another book inspired by a dream. (Yay, dreams!) This one came to me in a three act structure and I thought it would be easy peasy to write the thing, but the characters have demanded a bigger book and an earlier start to their story than I’d planned. I’m enjoying writing about the main character Taye Pocrejac because she’s not a conventional hero. She has a lot of faults—perhaps more than some readers will like—but her story is all about people looked down upon for one reason or another being heroic despite the scorn. 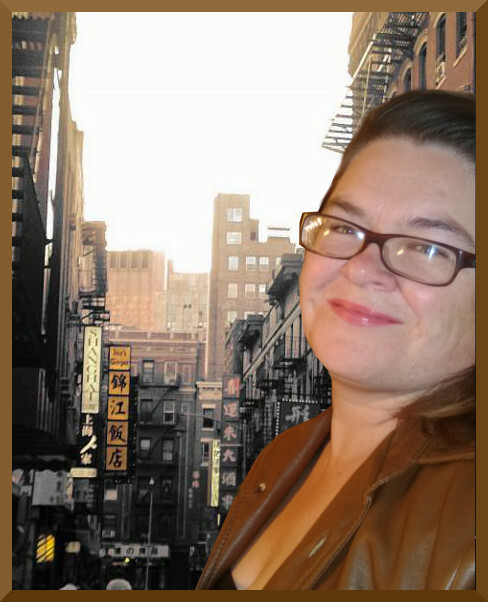 Right now I’m working within the urban fantasy genre. It has so many of the elements I love in books that I feel like it’s a great fit for me as a writer. I adore strong female leads, strong supernatural elements, and antiheroes, as well as villains I might—in another context—root for. The hardest part about writing The Bazaar was putting Devany’s kids in jeopardy. I know, I know, they are only fictional characters, but I kept thinking about my kids being in danger and it made writing those scenes agonizing. This book is a series. I have written the second already, have started the third, and just realized where I want to go for the fourth. I don’t outline because it kills my creative mojo every time I try it, so my ideas for the third and fourth might deviate from what I’m thinking right now. I do have the overarching theme of the series in mind when I’m writing and I am following my overall vision for Devany and her opposition. I personally love series. When I fall in love with a character, it’s both soothing and exciting to know that more books will be written about the character/s I love. Hell Wrecker, the book with Taye Pocrejac as a main character (and Lucifer as a very important secondary) is a stand alone. I don’t see those characters carrying more books, even a sequel. Well, maybe Lucifer. He is a rather showy guy. I did! I know it’s against the conventional wisdom for self-publishers to do their own but part of the joy of being an indie author is making my decisions about my work, for good or ill. I recently found GIMP (like Adobe Photoshop, only free!) and went a little crazy making covers—even for books I haven’t written yet! You can find Jennifer in any one of theses awesome places on the internet! Pretty awesome… but that’s because I find amazing new people to spend some time with! 🙂 Great fun to be sure!